APPLICATIONS: Used together with Flame Engineering 100,000 VT2 and 400,000 VT212 torch heads and other assemblies using standard 1/4" MNPT / FNPT fittings. Use as a shut off valve and applications where precise control of gas output is required. 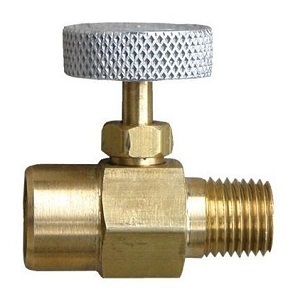 These precision machined valves offer a wide range of adjustment without stem galling. Perfect for isolating pressure gauges from bulk storage containers or upstream shutoff valves for torches and/ or outdoor burner applications. UL Listed. Can also be used with compressed air, water, etc.